Well, even those of you, who like me, will do almost anything to avoid the weeks of contrived, vacuous drivel this TV programme belches out will have heard of the show. Mediocrity hidden behind crashing introductions, flashing lights and an audience with their IQ stamped on their shoes whipped into a frenzy of whooping and weeping. Sounds anything but 'platinum', doesn't it? X Factor Platinum has 5 reels and 4 rows with 40 paylines. Fortunately there are no real images of those on the TV show to endure, just silhouettes of dancing and the standard A-K-Q symbols. You have non-multiplying stacked Wilds on every reel and a cheesy musical soundtrack to entertain you. 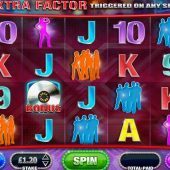 Before X Factor Platinum slot delivers the bonus round, there are a couple of in-play features to consider. On any spin an X Factor symbol may erupt from below any reel to make it Wild before the symbols land. The better random feature is the colossal Wild which may appear on the reels, a 3x3 block of 9 wilds. This is guaranteed to appear within the window in full. Some stacked Wilds on the remaining places can lead to a large win. There are platinum discs on reels 2, 3 and 4. These are an unwelcome reminder of the power of TV shows to transform turds into treasure as they peddle them to the unlfortunate public before Christmas each and every year. The only treasure you'll get from these though is 5 'Extra Factor' free games. In these free games extra stacked platinum discs appear on the reels and after each spin they will transform into any symbol chosen randomly to increase the chance of wins. They can be retriggered and often are, the only real blessing from this feature. X Factor Platinum admittedly raised my hackles before I even hit the spin button, but as I said before it bares little resemblance to the TV show. As a slot it's quite playable but not very exciting due to the lack of big win potential and the volatility being quite low. The in-play features are not too frequent and neither are the free games so it relies on smallish reel wins most of the time. Will I be a regular player on this slot? It's going to be a no from me.